On the eighth day of Christmas, my true love gives to me eight maids a-milking. The ancient carol reminds us that happiness comes to us in a variety ways; and as Jesus tells us, all ways lead to The Way. Christ continues to lead us along the path that asks us to reduce ourselves so that he may increase in our lives. This Way is narrow yet full of blessing and promise that come to us through inversion – as does so much that Christ explains to us. Blessed are the poor in spirit, the mourning, the meek, the ones who hunger and thirst, the merciful, the pure in heart, the peacemakers, and those who suffer persecution for righteousness’ sake. Rather than encourage self-centered thinking, Jesus asks us to care for others as readily – or even more – than ourselves. This is difficult living, Christ reminds us, yet the reward will be great indeed. Theirs is the kingdom of heaven, they will be comforted, they will inherit the earth, they will be filled, for they will receive mercy, they will see God and be called children of God, for again . . . theirs is the kingdom of heaven. Contrary to a world that tells us to tend to ourselves, Christ asks us to show preference for those on the margin. Despite this apparent contradiction to survival, Jesus promises a life that is beyond any we might have expected. A life that produces fruit in endless abundance. Rejoice and be glad, for your reward is great. On this first day of the new year, let us explore the words Christ has for us about happiness, one of the gifts he brings to us this Christmastide; and let us consider how we might find this eternal bliss today and all days. We might imagine ourselves discovering Christ just as we break bread with him. We might imagine his disappearance as a disappointment or as an opportunity to share the joy of Good News with others. Our reaction to Christ’s presence brings us great fear, great sorrow, great joy, or a mixture of many emotions. How do we write our own story? God says: You may find this story difficult to believe. You will want assurance that you would not miss my presence among you; yet you need not be afraid. I am not angered that you overlook me, gaze past me, and cringe away from me when I appear as the homeless, the hungry, the refugee, and the poor. When you suffer embarrassment, all you need do is turn to me with a vulnerable heart. When you are uncomfortable each time I come to you as the marginalized, all you need do is open your arms to me. When you are angry with circumstances you cannot control, ask for my guidance and protection. I have the strength and persistence, the love and fidelity, the hope and energy to be with you through every moment of your suffering. Give me your anxiety and fear. Come away and break bread with me. All the rest is nothing. I am all. And I am enough in this day and in all days. 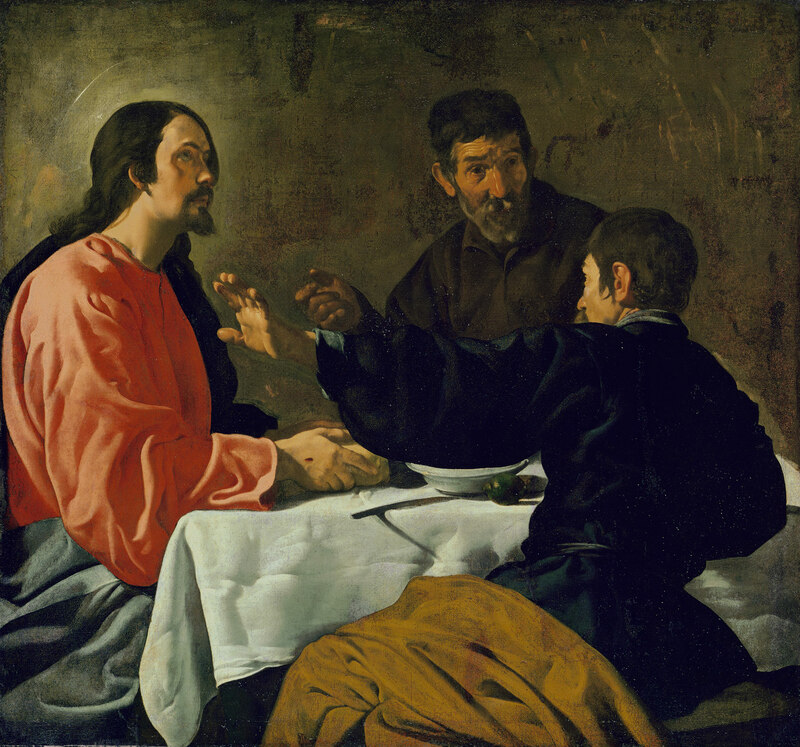 When we spend time reflecting on this story, and when we admit the number of times our anger or discomfort have gotten the best of us, we realize that we, like the Emmaus disciples, have the opportunity to break bread with Christ himself. The prophets warn, threaten, exhort, and promise us that God is always present, even though we may not recognize this presence. The Old Testament prophecies foreshadow the good news of the New Testament, and they remind us that no matter our circumstance God’s joy rescues us from sure destruction, Christ’s joy redeems us from our recklessness, and the Spirit’s joy heals us despite the gravity of our wounds. Today Habakkuk reminds us that too often our ways are not God’s ways. God says: I know that my plan seems slow to you and I understand your impatience for my ways are not always your ways. My prophets deliver your anger, exasperation, and sorrow to me; and I hear your plaint. My prophets also deliver My Word to you. I walk among you as the man Jesus and although you may not see him he is with you all the same. The anger of Habakkuk has not dissolved . . . and nor has my love. Each time you throw your anger at me I return it to you transformed in and by and through love. I return it to you as the gift of love. Read the words of Habakkuk . . . and bring me your fears and desperation. Bring me your sorrow, your worries and your questions. In return, you have my answer . . . the gifts of my presence, mercy, rescue and love. In this prophecy . . . we have the eternal answers to our unrelenting questions. Senior, Donald, ed. THE CATHOLIC STUDY BIBLE. New York, Oxford University Press, 1990. 1150. Print. If this week’s Noontimes call you to search for more ways to encounter Joy or urges you to investigate the New Testament, click on the word Joy in the categories cloud in the blog’s right hand sidebar and choose a reflection, or enter those words in the blog search bar. You may want to visit the Joy for the Journey blog at www.joyforthee.blogspot.com. “The office of prophet was due to a direct call from God. It was not the result of heredity, just as it was not a permanent gift but a transient one, subject entirely to the divine will”. (Senior 877) Today joy comes upon us from the depths of fear as a people lifts hope high . . . waiting for the coming of the Messiah. Full of symbols and imagery, this book of prophecy signals an impending change when a new Jerusalem will replace the vanquished one. Many of the ancients settled on the simple understanding that a new city would rise physically from the foundations of the old; and in so doing, they missed the greater portent of the Messiah’s coming. The apostle John (2:19) records Christ’s promise to raise up again the ruined temple in three days. And so does Jesus promise to return from the dead to rescue the faithful. This is an event to celebrate, even in the midst of despair and fear. Verse 2:10: Sing for joy and be glad, O daughter of Zion; for behold I am coming and I will dwell in your midst,” declares the Lord. Today we celebrate the arrival of the master healer and we remember that joy is most sweet when it fulfills the age-old promise to arrive in the hour of sorrow. Christ’s joy offers new life in the face of death, and dims the memory of all suffering. For Christ’s joy is found in God’s infinite mercy and the power of the Spirit to bring us God’s never-ending love. Let us rejoice with the shepherds and angels at this marvelous entrance God makes into our lives . . . in the sweet person of Mary’s child. If this week’s Noontimes call you to search for more ways to encounter Joy or urge you to investigate the New Testament, click on the word Joy in the categories cloud in the blog’s right hand sidebar and choose a reflection, or enter those words in the blog search bar. You may want to visit the Joy for the Journey blog at www.joyforthee.blogspot.com. Senior, Donald, ed. THE CATHOLIC STUDY BIBLE. New York, Oxford University Press, 1990. 877. Print. From his prison Jeremiah continues to cry out the word of God. Call to me, and I will answer you; I will tell you things great beyond reach of your knowledge. From our own prisons of unhappiness, illness, anxiety or fear, we might also listen for the word of God. Through his prophecy, Jeremiah continues to console the lost. Behold, I will heal them, and reveal to them an abundance of lasting peace. From our own sadness or sorrow, we might also offer a word or gesture of solidarity. Through the promise of redemption, Jeremiah continues to call us to God. I will fulfill the promise I made to the house of Israel and Judah. I will raise up a just shoot; he shall do what is right and just in the land. From our yearning for seeking, we might also bring God to all that we say and all that we do. Spend time today with Jeremiah 33. Study other Bible versions of these verses by clicking on the scripture verse here or above. Compare translations and listen. Like Jeremiah, we will hear God’s word. And also like Jeremiah, from our prison, we will send it on.